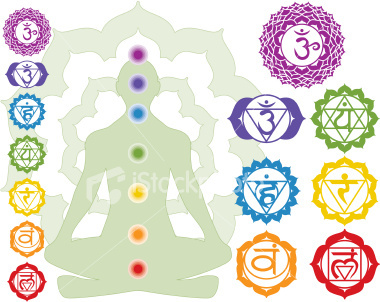 Chakras (pronounced Sha-Kra) are energy centers in the body. This ancient Sanskrit word, which means "wheel" describes the way these energy centers spin in the human body. When they become clogged with toxic energy, psychic debris, fear, stress and worry, they do not spin properly, or regulate the energy in the body. We feel how out of balance our chakras are when we are overwhelmed with stress, anxiety, worry, fear, insomnia and other outward manifestations of unbalance in the body. A chakra clearing, healing and rebalancing realigns these vital energy centers and helps you get back in touch with your inner voice, intuition, timing, creative energy and wellness. Our chakras are changing and absorbing energies all day, every minute of the day, so it's a good idea to add this healing to your regular wellness routine. With meditation, practice, and guidance, you can clear and balance your own chakras but if you're uncertain of doing this for yourself, please let me assist you with this vital balancing healing.